Thanks to the more than 300 people who made Sunday’s Ghostly Gallop a huge success! The weather was perfect for running, the crowds cheered every participant, almost 80 children finished and even a couple dogs and a few “stroller babies” were seen on the course. Several competitors mentioned the new course and the addition of chip timing – giving them a “personal best” to try to beat during the coming year. More than 15 sponsors helped – either through donations or in-kind gifts of goods or services. Those generous donations covered the costs of the event. Other anonymous sponsors helped underwrite the participation of the kids – offsetting a portion of their registration fees. Volunteer Mark French (founder of Sean’s Run) acted as announcer, naming every participant as he or she crossed the finish line – adding a personal touch. And all runners and walkers in the 1-mile fun run got medals for their efforts. The Dept. of Public Works and Emergency Services teams lent their expertise. And our special thanks to the firefighters and Hudson Police for keeping the course safe. Did we mention the VOLUNTEERS? We couldn’t have done this without you! To see complete results, go to www.GhostlyGallop.info. 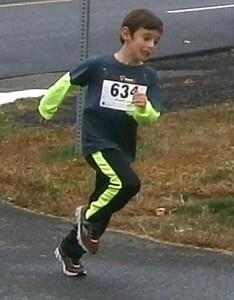 This entry was posted in Fundraising and tagged 5k, benefit, fundraiser, Ghostly Gallop, hudson area library by Emily. Bookmark the permalink.